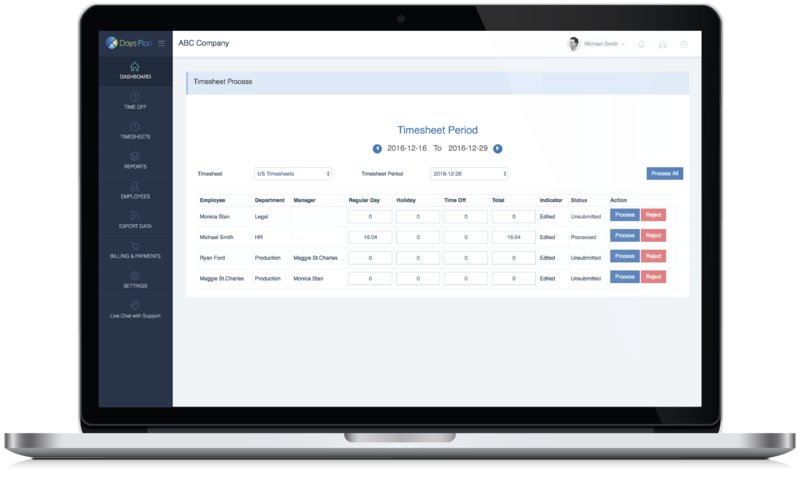 The all-in-one platform for tracking employee hours and processing timesheets. The DaysPlan Timesheet system is a fully standalone module that provides organizations a simple yet effective way for their teams to enter time cards for Clock In or to enter time spent on Projects or Tasks. Time sheets can be a broad term to track time – time spent working on a regular work day, on overtime hours, on specific tasks or for teams on an entire project. And, that is where the flexibility of DaysPlan to handle these different and varied possible applications, makes it useful tool to have with you. It’s simplicity will mean that employees will enter their time without numerous reminders and the reminder feature in DaysPlan Timesheets, will save you the effort to send the reminders. Take advantage of the free Data Setup feature and enjoy a turn-key solution. You can send us your employee data amd time sheet requirements and let the DaysPlan support team get you up and running. Make your timesheets play by your rules. Create custom work schedules, then easily develop timesheets based on your parameters. You can even choose if employees clock in or manually enter their hours. Tired of reminding employees to enter their hours? DaysPlan automatically notifies your staff to clock in or enter their hours whenever they log in. Get a daily view of who has clocked in, who is out for lunch, and who has left for the day. Never second guess office attendance. At the end of the pay period, you’ll be able to review your staff’s hours. Then, you can process or reject an individual timesheet, or choose to process them all at one time for convenience. Easily create a custom spreadsheet of your timesheets’ data for outside use. Our exporting feature gives you detailed control over the content of your spreadsheets. Start today with a Free 14-day Trial. No credit card required.